A common factor in many of John Stanley's post-1955 comic book stories is their creator's evident lack of personal enjoyment. The creation of mainstream comic books is almost entirely not about art. It pays badly, it's often high-pressure work, and until recently, most of its publishers regarded the end results as disposable and fleeting. Like any business, it's built on making bucks. Quality is a surprise by-product. That any memorable or lasting work has appeared in American comic books is a small miracle. John Stanley was perhaps spoiled by his first and best editor, Oskar Lebeck. Like William Gaines and Al Feldstein of E.C. Comics, Lebeck cared about the quality of his creative team's output. When Stanley lost Lebeck's guiding hand, in the 1950s, he suddenly seemed to enjoy his work much less. 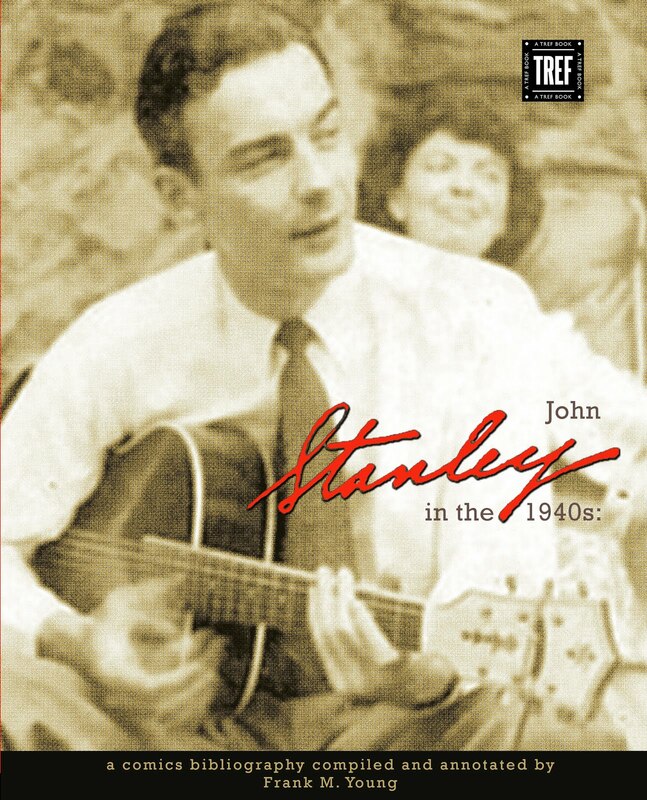 As the 1950s wore on, Stanley's work becomes more mechanical and less spontaneous. 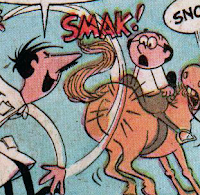 Stanley's gritting-of-teeth, in the last two years of Little Lulu, overshadows any moments of genuine inspiration and joy. The stories are still of an overall high quality, but they seem forced. Despite themselves, they continue to entertain and, occasionally, surprise. They have much less wattage than Stanley's work of the 1945-55 period. If Stanley felt burned out on Little Lulu in its last couple of years, he made some effort to disguise his ennui. 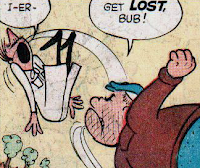 The real fallout of his burnout hit hard in Stanley's oft-joyless tenure on Nancy/Nancy and Sluggo. 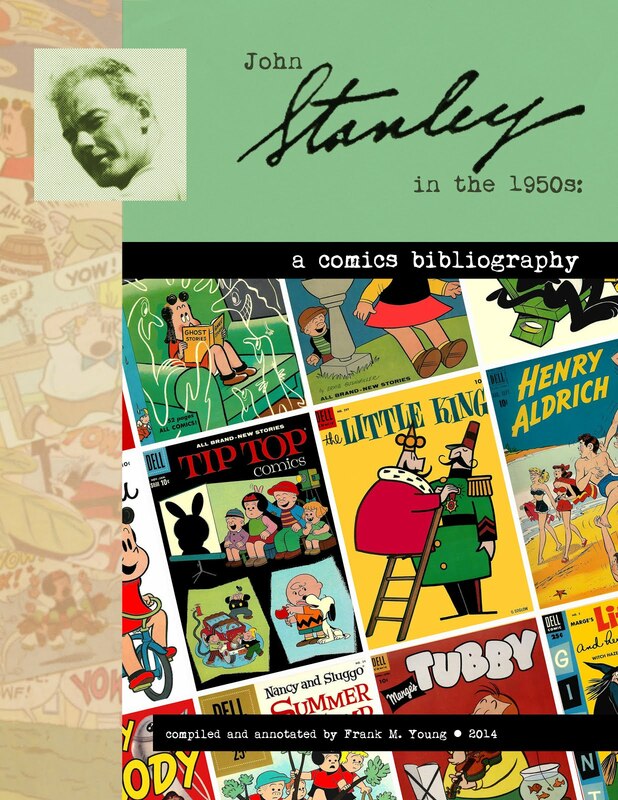 Though frequently inspired, Stanley's Nancy work bears the weight of responsibility, and obligation, over the sense that the creator genuinely gets a kick from his work. As Nancy represented a forced attempt to tread the oh-so-familiar ground of Lulu, it's most impressive when Stanley's anger and frustration elbows its way to the stories' fragile, downcast center-stage. There is energy in Stanley's anger--a vitality that also fuels the much better, more original series Dunc 'n' Loo. 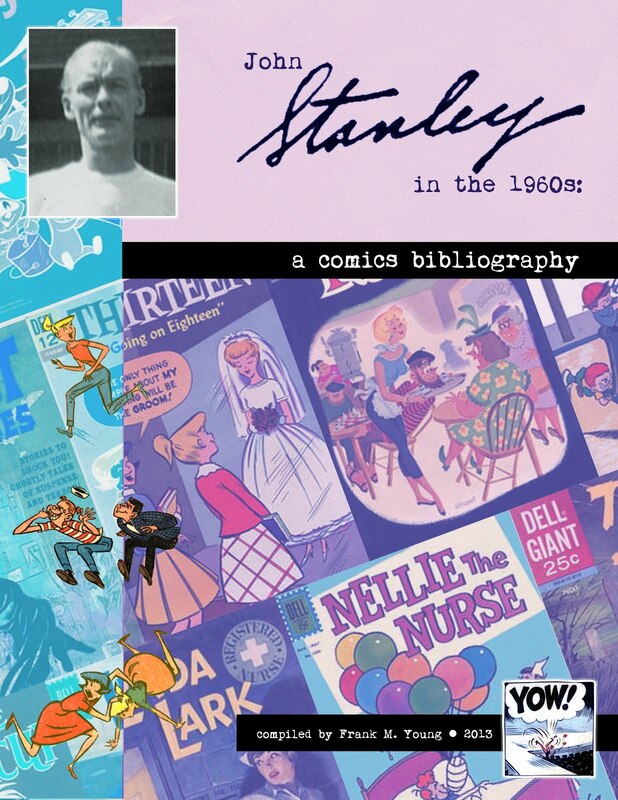 Had the fun gone out of creating comics for John Stanley, as the 1950s ended? Not entirely. He found his way back in the 1960s, via his two "auteur" series, Melvin Monster and Thirteen Going on Eighteen. An important transitional title was Clyde Crashcup, based on a TV cartoon property. We've done Clyde here before, but its significance, in the amount of fun Stanley seems to have with this series, has grown on me. Like Lulu's Tubby Tompkins, Clyde is a perfect character for John Stanley. Self-obsessed, quixotic and fearless, Clyde is also a creator. With his magic pencil as the conduit from his subconscious to comic book reality, he can realize anything, have it function, and retool it on the fly. The irony is that all these things already exist. Clyde is too well-sold on his own brilliance to stop and think that someone, somewhere, must have had the same idea and, sans magic pencil, done it the hard way. his fittingly mute assistant, Leonardo, attempts to act as the always-needed Voice of Reason, typically in vain. Like most of John Stanley's work for comics, this is a re-think and refinement of an existent idea. Rather like Clyde, Stanley "invented" what was already there--but did the character better by improving and expanding on the (typically under-developed) original. Thus, Stanley owns Clyde, Little Lulu, Woody Woodpecker and The Little King in a way the original creators don't. They had the birth of a notion, but nothing else (with the exception of Otto Soglow, whose own creativity just about meets Stanley's). This third issue of Clyde Crashcup is perhaps the best of the five-issue run. Reunited with his longstanding Lulu partner, Irving Tripp, and given an unusual character he can really sink his teeth into, John Stanley rolls up his sleeves and has fun with his work. "Clyde Crashcup Invents The Scare" is something of a tour de force for artist Tripp, as he fearlessly depicts wild horses, roller coasters, haunted houses and dirty dishes with a solid-yet-sketchy astro-modern cartooning style. Crashcup's self-absorption and unflappable self-belief fuel this story. He believes that only he can cure Leonardo's hiccups, and creates an ever-growing arc of devices to attempt this simple task. The grander these ideas become, the more of a toll they take on their creator--while effecting no change whatsoever on Leonardo's gastric distress. As Crashcup says of his final creation's self-effect, "one more second... and I'd have lost my REASON!" In a finale apt for the "Goodman Beaver Lite" vibe of the series, a kid's exploded paper bag cures Leonardo--and transfers the hiccups to Crashcup, now able to torment himself further. 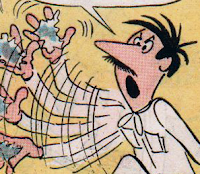 "Clyde Crashcup Invents Glue" clicks on the inventor's obvious high self-regard. "I am admiring an EXCELLENT PICTURE of me in today's newspaper," he glibly admits at story's start. That self-love is echoed by a series of increasingly self-destructive invention attempts, as Clyde tries to capture that self-image for posterity. Tripp's lively, loose cartooning helps sell this simple story, which again ends on a self-evident note of irony. By now, Stanley is fully warmed up, and in "... Invents Deep-Sea Fishing," he makes some rare self-referential remarks, via his characters. 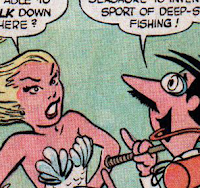 In a genuinely Kurtzman-esque moment, Crashcup addresses a trope of comic books and animated cartoons--something we take for granted, as no attention is called to it. Tripp has some fun with the blowsy blonde mermaid, who also sees fit to question Clyde's ability to speak under-water. 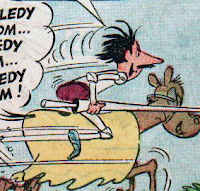 We mostly know Tripp for the stiff, mechanical linework of Little Lulu. It's a pleasure to see him cut loose in this series. The last two stories revisit some pet themes of Stanley's "Lulu"-- the war of the sexes and the questionable pleasures of the public park. "Clyde Crashcup Invents Chivalry" frames the inventor's eccentricities against a merciless world of "...selfish men and roughneck ladies!" For the first time in this issue, we see Clyde and Leonardo in a world not of Crashcup's invention. Like the worlds of Dunc 'n' Loo, Melvin Monster and Thirteen, it's not an easy place for a sensitive soul. Noble deeds are misinterpreted, and mankind's first impulse is to react with violence, not reason. If this is Clyde's reality, small wonder he spends so much time in retreat, re-creating a habitable universe. That these attempts fail adds a layer of poignancy to what would otherwise be a mechanical sitcom shell. Clyde's attempts to create the world of Arthurian chivalry--a more brutal place than the 20th century--is more heart-breaking than funny, despite a clever reference to Cervantes' myopic tilter-at-windmills, and a hip update of the Robin Hood cliche. For the first time, Clyde gains some humanity, whether by design or by blissful coincidence. This mood is sustained as "Clyde Crashcup Invents Spring--" a timely farce, as we descend into the season of pollen, stinging eyes and burlesque-comedy sneezes as a way of life. Again, Clyde rebels against the establishment--both of the uncontrollable climate and the regulated-but-dangerous world of the urban public park. By inventing spring, as a reaction against the "...endless dreary round of COUGHS, COLDS and SNEEZES," Crashcup blindly sets himself up for more negative social interactions. Bees, cops, rams, babies, jealous boyfriends and mud puddles batter our innocent hero relentlessly. He, of course, winds up sick in bed from this caring attempt to force the world to be a nicer place. That familiar John Stanley message--that the world is a frightening, uncertain place--caroms through his two decades of published work. It sounds more often, and more shrilly, in his stories of the 1960s, and casts a shadow across the most light-hearted events. In his hands, Clyde Crashcup is more than another droll Space-Age throwaway. 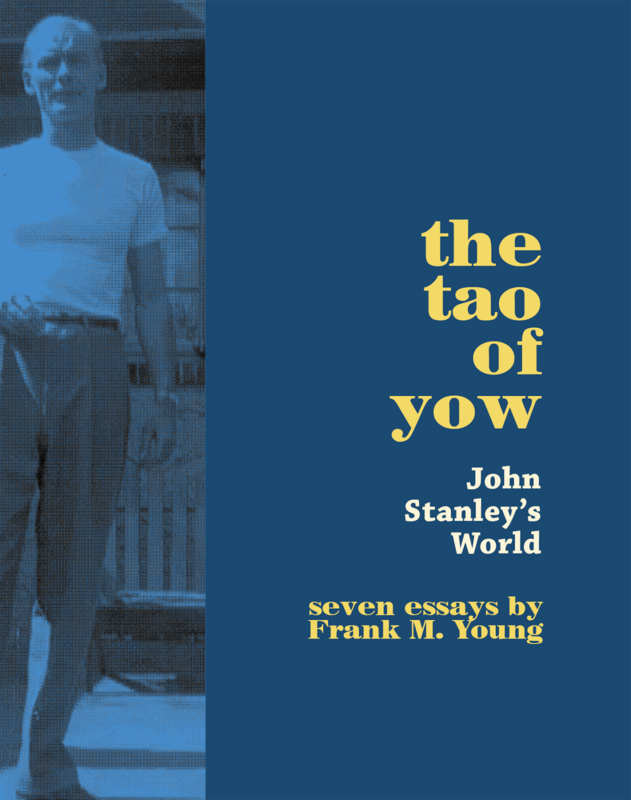 While Stanley's joy of creation shines through these five stories, the heavy weight of his central, melancholy message anchors their knockabout antics. This was Stanley's greatest gift as a comedic writer, and constant tension of dark and light in his late work remains gripping--moreso than the comics themselves have the right to be. P.S. 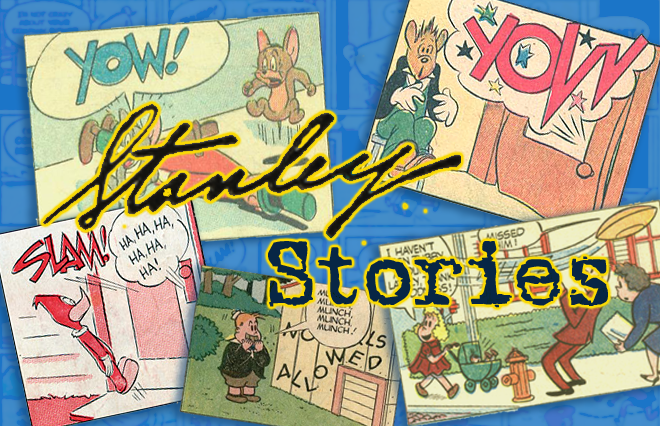 : All of Stanley's stories for this series are now available via this blog. Enjoy!